Now 19 years old, Alice returns to the whimsical world she first entered as a child and embarks on a journey to discover her true destiny. Question of the day: does Tim Burton create remakes? Over the years, he’s raked in the big bucks when his movies covered well-trodden ground. 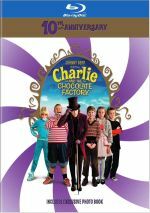 2005’s Charlie and the Chocolate Factory, 2001’s Planet of the Apes and 2010’s Alice in Wonderland all became big hits. In addition, all already existed as famous film counterparts from earlier years – editions that’ll likely exhibit greater “staying power” than the Burton versions. Should we consider these to be remakes? I don’t – I see what Burton does as readapting, not remaking. To me, a remake takes a cinematic property and essentially just recreates it with some tweaks. Instead, Burton goes to pre-film sources and readapts them. Is this a fine line? Sure, but I think there’s a difference involved, and it’s one that potentially means Burton’s movies will offer more than simple remakes. Or maybe not, as I think none of the readaptations I’ve cited managed to surpass the earlier flicks. Apes and Charlie were both pretty weak compared to their predecessors from 1968 and 1971, respectively. In addition, virtually nothing on display in Burton’s Alice makes me want to forget the Disney version. 19-year-old Alice Kingsleigh (Mia Wasikowska) finds herself trapped in a chilly, lifeless world. Expected to marry stuffy Hamish (Leo Bill), she doesn’t find this prospect appealing. When Hamish proposes in front of the gathered masses at a party, Alice revolts and runs into the woods. There she falls into a rabbit hole and finds herself smack dab in a mysterious, fantastical world called Underland. But not for the first time, apparently. As she wanders through Underland – which the younger Alice called “Wonderland” - Alice encounters plenty of odd characters who regard her either as savior or threat. 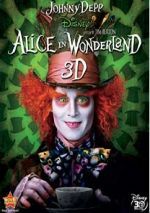 We follow Alice’s adventures with the Mad Hatter (Johnny Depp), the Red Queen (Helena Bonham Carter), the White Queen (Anne Hathaway) and others as she attempts to deal with the upside-down reality of Underland. She also needs to face her destiny as the one to slay the Jabberwocky and restore order to the land. Once upon a time, I was totally in the bag for Tim Burton. Pee-wee’s Big Adventure remains one of my all-time favorite flicks, and from 1988’s Beetlejuice through 1996’s Mars Attacks!, I either liked or loved each one of his flicks. 1998’s Sleepy Hollow became the first chink in Burton’s armor. Oh, I didn’t dislike the movie, but it didn’t do a whole lot for me. Apes and Charlie seemed mediocre to weak. Big Fish and Sweeney Todd worked better, though I didn’t think either quite qualified as great. Alice falls firmly in the same territory as the flawed reworkings of Apes and Charlie. Rather than go for the sense of skewed nuttiness one might expect from Alice, Burton attempts more of an action flick vibe. There’s little comedy on display, as the film usually digs into Alice’s quest and the confrontations that eventually lead to her battle with the Jabberwocky. The lack of balance makes Alice surprisingly dull. The film wants us to view events as wild and wacky, but they seem forced, and it lacks much in the way of charm or poetic whimsy. Instead, it bludgeons us with its aggressive nature. On one hand, I appreciate the fact that Burton doesn’t just give us the umpteenth rendition of the same old Alice, so it’s refreshing to get a new spin on the tale. However, I think he goes too far astray, as the movie fails to deliver the enchantment one wants from a tale such as this. It feels like Burton simply used the basic Alice characters and altered them for his own means without any regard for the spirit of the source material. Burton also focuses way too much on the visual effects. CG pervades the film and often feels gratuitous, as though Burton decided to use those elements because he could, not because he should, and that becomes a major distraction. I spent too much time thinking about how the movie executed its visuals and too little feeling absorbed in the story or characters. In addition, Burton tends to mistake elaborate production design for actual flair or inventiveness. Not much real creativity emerges here. 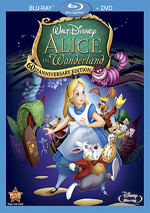 Burton creates a detailed but not very interesting vision of Wonderland, and the visuals fail to add to the experience. I respect the craft involved but don’t think the movie ever threatens to transport me anywhere. In terms of the cast, Wasikowska seems utterly forgettable as Alice. As featured in prior films, young Alice was always something of a cipher, and the nutty inhabitants of Wonderland were the ones meant to be interesting. That’s still somewhat true here, but given the heroic nature of the part, the 2010 Alice needs to be ore charismatic and bold. She’s not – at least not as depicted by Wasikowska. This Alice just seems dull and whiny. She’s neither likable nor unlikable. Instead, she’s simply kind of there, and she lacks the personality to carry the movie. Of the stars involved, Carter does the best. Indeed, she becomes the only spark of life here, as she creates just the right kind of snippy, self-involved personality required. When Carter appears, she threatens to make the movie interesting, though she can’t overcome its inherent dreariness. I can’t say much for Depp’s performance here. Oh, Depp certainly isn’t bad as the Hatter, but he seems a bit self-conscious in the part. His Hatter isn’t particularly mad or charming. Occasionally it feels like he’s a prominent character just because Depp’s involved, not because the story requires it. At no point does Alice threaten to become a bad movie, and I will admit I liked it more on repeated viewings. However, that’s more due to the fact I felt utterly bored during my theatrical screening. Alice attempts to reinvent an old tale but does so with mediocre results. 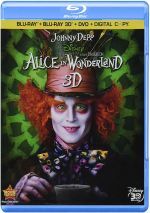 Alice in Wonderland appears in an aspect ratio of approximately 1.85:1 on this 3D Blu-Ray Disc. Despite some ups and downs, this usually became a satisfying presentation. For the most part, sharpness worked fine. A few wide shots and interiors showed minor softness, but those instances were infrequent, so the movie usually seemed accurate and concise. I noticed no issues with jagged edges or shimmering, and edge enhancement failed to create distractions. The movie came free from any source flaws and looked clean from start to finish. Colors appeared positive. The movie didn’t go with terribly lively hues, but along with the usual teal tint, it favored a good sense of reds and oranges that looked warm and full. Blacks were dark and tight, while shadows demonstrated nice clarity much of the time, though the shots of Alice in the rabbit hole tended to feel too dark. Shot on 2D cameras, Alice went through a 3D conversion back before Hollywood managed to semi-perfect these techniques. That said, the film used the stereo imaging in a largely involving way that made it an above-average conversion for its era. This meant a few somewhat awkward scenes that could come with too much of a “pop-up book” feel – such as when Alice fell into the rabbit hole. Those sequences remained in the minority, though, and the movie usually brought out a fine sense of depth and dimensionality. As usual, flying/floating components used the 3D imaging best, and the climactic battle with the Jabberwocky delivered the most dynamic segment of the movie. While this didn’t turn into a great 3D rendition, I thought it satisfied and made the film more entertaining. The DTS-HD MA 5.1 soundtrack of Alice worked even better. With its many action scenes, the movie boasted a dynamic soundscape with plenty of material from all five channels. The track became the most compelling during the battle-packed third act, but it offered a great deal of involvement the rest of the time as well. Various elements zoomed around the room and created a fine sense of environment throughout the film. It even chipped in a lot of well-placed directional dialogue to boot. Audio quality seemed satisfying. Music appeared full and lush, with nice highs and deep lows. Dialogue was consistently concise, and effects provided positive delineation. Those elements added strong low-end response as well and made sure this was a compelling soundtrack. In terms of extras, this one-disc release of Alice includes none. However, a “deluxe edition” provides a mix of supplements. These appear on the 2D package I discuss here, and the “deluxe” edition provides all of the above-linked set’s components along with the 3D disc. If you want the bonus materials as well as a 2D version of the film, find that set – but don’t knock yourself out for the supplements, as those extras lack a lot of substance. Mass audiences really took to Alice in Wonderland and made it a huge box office success. I can’t quite figure out why, however, as I think the new adaptation lacks much entertainment value or charm. The Blu-ray provides excellent audio and a largely involving and well-reproduced 3D presentation. The disc lacks supplements but the 3D version becomes the most fun way to view the movie.